Bultaco's line of street-certified Brincos is poised for release, meeting all kinds of needs for a whole range of different riders. The Bultaco Brinco R, the trailblazer of the innovative MOTO BIKE concept, has been on the market for less than a year, and is already being rounded out by three new versions, all of them street-certified: the Brinco R-E, Brinco C, and Brinco S.
BRINCO R: Racing, top performance for use on private tracks and trails. BRINCO R-E: The Brinco R, now street-certified. There are no limits. BRINCO C: Off-road, for easier rides in the country. BRINCO S: Street, the urbanite, pure fun in the city. To celebrate the release of these three new versions Bultaco is launching a campaign for all those who want to be among the first to enjoy a street-certified Brinco this summer: those reserving before June 15 will be entered into a drawing to win a second Brinco to share with a travel companion. On the Web, at promobrinco.bultaco.com, one can easily make a reservation and pay the €600 deposit. The Brinco now boasts a big family. And, as in any family, each member has his own personality and different needs and tastes, while sharing common DNA: fun, passion, a penchant for innovation and being different. The urbanite, the adventurer, the one who loves long rides in the country ... and those who like to gather as a family to share magical moments together ... they will all find what they're looking for in our line of Brincos. 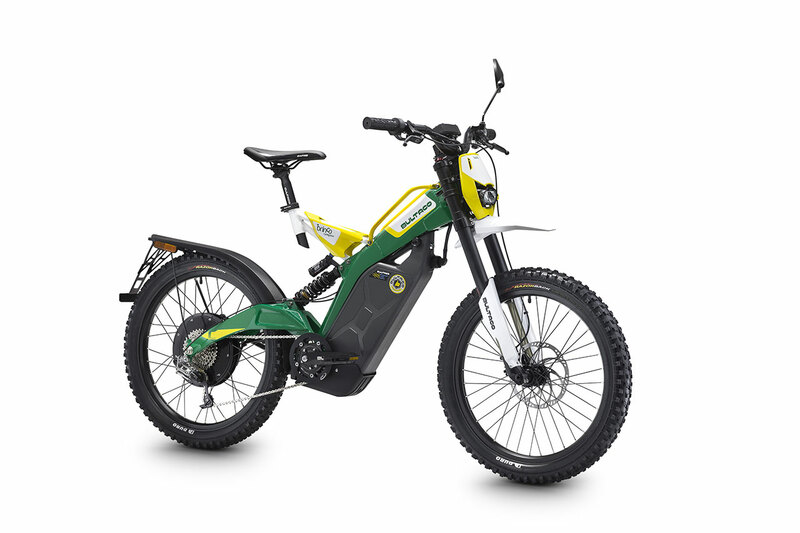 The trailblazing BULTACO Brinco R is our genuine, non street-certified version, our sportiest, and the perfect choice for those who want to enjoy rides on private trails and tracks, along with high-performance features, with its powerful motor and motorcycle frame and shock absorption bearing the Bultaco seal. The Brinco R boasts a PRO suspension system with an adjustable inverted fork featuring a spectacular 180 mm of travel on the front wheel, and 217 mm on the rear, along with high-performance tires allowing riders to head anywhere they want. The ultimate in fun, without any limits. The motor is the same on all the Brincos. 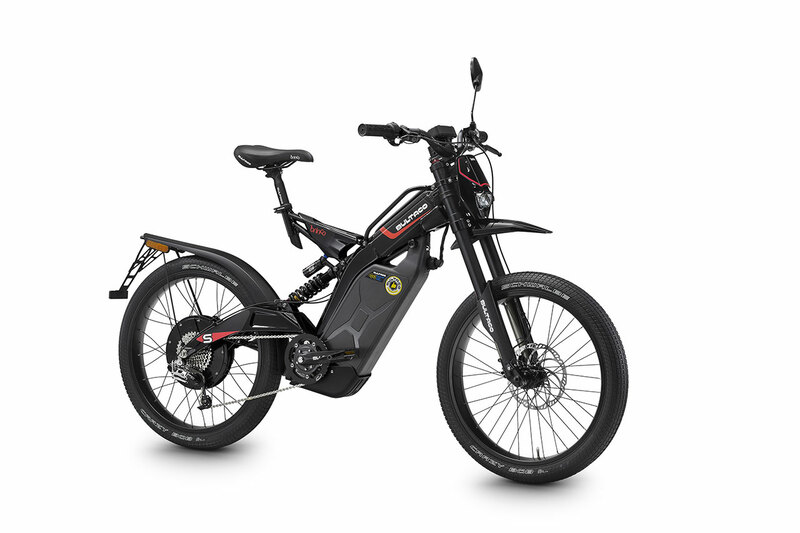 With maximum power of 2 kW and a top speed of 60 km/h, it packs the capacity to take you anywhere, and its energy can be dosed out using its three different riding modes: Sport, Tour and Eco. The electric motor's power is supplied by a powerful, highly durable 1.3 kWh Lithium-Ion battery that weighs just 1.5 kilos and can be completely recharged in only three hours using a household outlet. The battery life on the Brincos will depend on what mode they are used in, ranging from 50 km, in Sport mode, to over 100 km, in ECO mode. 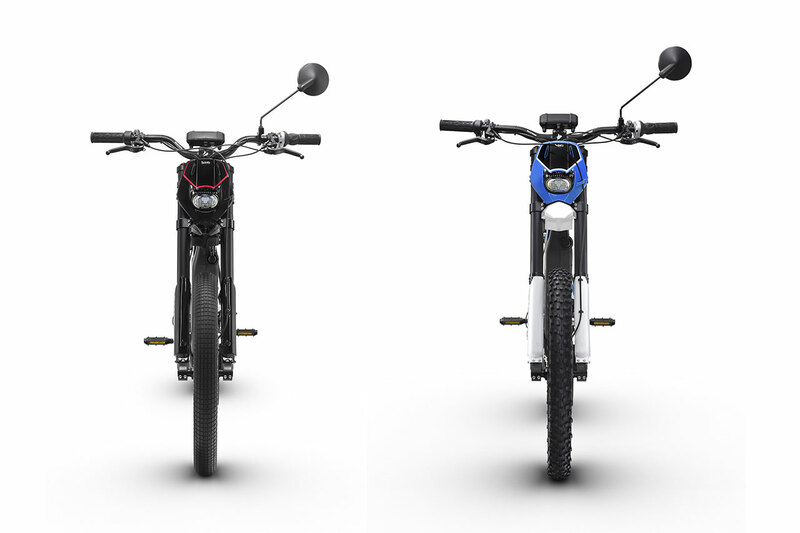 All three versions will feature all the components required for certification: rear view mirror, rear mudguard with a license plate mount, front headlight, rear reflector, side reflectors, rear light, side kickstand and horn. The street-certified version of the Brinco R is the R-E, which retains all the features of the Brinco R, but can be ridden without any restrictions. It is the all-purpose Brinco par excellence: though it can be taken off-road, it can also be ridden on public streets, in both city and in the country. The R-E is the Brinco for those who love off-roading and sporty features, but don't want to give up using it for all kinds of riding, on all types of terrain. The Brinco R-E differs aesthetically from the Brinco R in that it includes everything needed for use on urban roads, such as a rear view mirror, rear mudguard with a license plate mount, headlight (LED with automatic ignition sensor) and reflectors; rear, side, and on the pedals, as well as rear and brake lights, a side kickstand and the requisite horn. Bultaco wants to give all kinds of riders the chance to have and enjoy a Brinco. The Bultaco brand guarantees top quality and prestige, and an exclusive product that the most advanced riders will be able to take full advantage of, but there's a Brinco for everyone. The Brinco C is the perfect choice for those looking for more leisurely rides in the country, without any need for the most high-performance features. The Brinco C features a more comfortable riding position than the R and the R-E, thanks to its lowered seat (50 mm lower than the R, R-E), comfortable touring handlebars (10 mm wider and with a more ergonomic design). The suspension systems, on the Brinco C dubbed "Comfort," feature 150 mm of travel, front and rear, rather than the 180 mm on the R and R-E, up front, and the 270 mm in back. 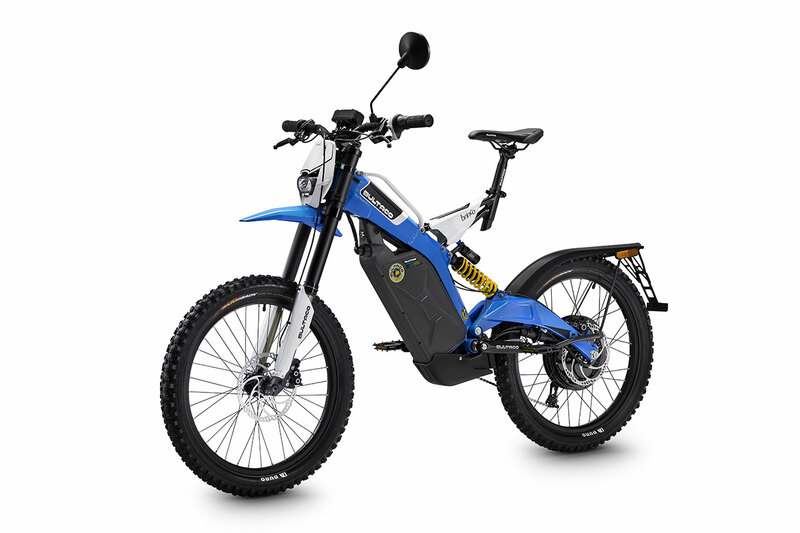 The Brinco C is a version certified for all kinds of use. Equipped with fewer of the sportiest features, it is more accessible for riders of all types and sizes. The perfect choice for fun rides in and outside the city. It is easily distinguished from the rest of the line by its unique green and yellow, along with all the components required for its certification, as described above. The Brinco’s “urbanite” is branded with the letter S, for "Street", and offers two elegant color combinations, in black and white. The Brinco S sacrifices nothing in terms of its sturdiness, quality, features and prestige – all genuine Bultaco. The product's philosophy is exactly the same – 100% fun – but its technical solutions are designed for riding in the city with reference to its features and the comfort it delivers. This is the Brinco for those looking to get around the city combining the exercise of pedalling with the energy from its powerful motor, or to enjoy a pleasant weekend ride, or for a fun ride to work, and a trip back getting some exercise and eliminating the toxins from a hard day at the office. The Brinco S is designed for more city-bound users: a comfort-oriented suspension, 150 mm of travel, front and rear, in this case on road wheels with 24-inch rims and studless tires. 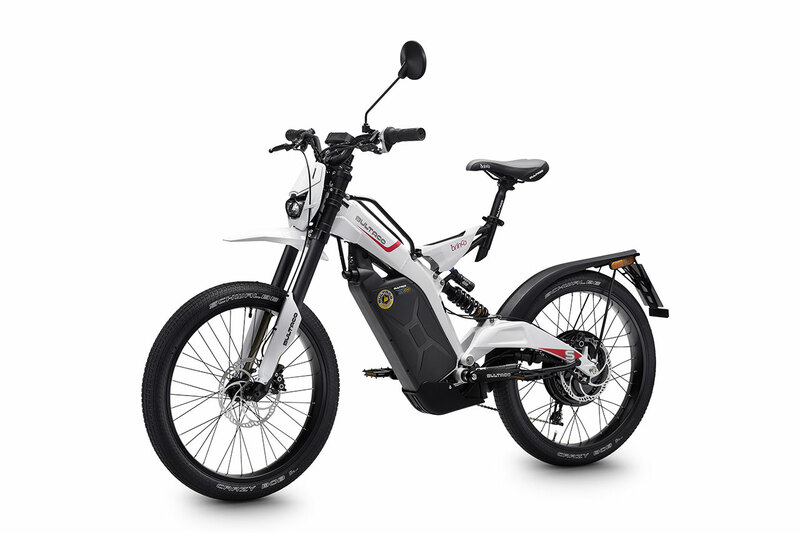 The Brinco S is undoubtedly the Brinco offering the highest level of comfort in the line, with a lower seat (50 mm) and comfortable touring handlebars (10 mm wider than on the R/R-E, and with optimized ergonomics) - like on the Brinco C - and it is also equipped with a comfort-oriented seat, standard. Like its Moto Bike concept, Bultaco is ahead of his time, innovating and responding to the transport needs of the future, with a view to its customers and users. To this end and with this in mind Bultaco has created a complete and powerful technological APP, for the benefit of all its bultaquistas, to function as a meeting point and essential tool allowing users to get the very most out of their Bultaco Brincos, and Bultaco's releases in the future. A technological forum to see, consult and enjoy the essential user manual, have immediate access to information and documentation on the Bultaco Brinco, and a link to the original platform: bultaco.com, which is linked to the social networks, the spare parts catalogue, and everything related to the brand. With the Bultaco APP the user will always be able to locate his Brinco, and have access to all his routes. And this is just the beginning. More and more services will be available. Everything that is valuable and useful to enjoy and get the very most out of the next generation of Bultaco products. Bultaco Motors continues its commercial expansion through the deployment of a distribution network, both national and international. In Spain it already has distributors up and running in Madrid, Barcelona, ​​the Canary Islands, Murcia, Zaragoza, Bilbao, Granada and Valencia. Outside our borders it has signed distribution agreements in the UK, France, the Benelux, Norway, Sweden, Portugal, Romania, and also in South America. Worthy of special note is the opening slated for June of Bultaco's first dealership in the city of London, where on 17 May, 2014 the Thumb-up brand announced the start of a new era.